Take away The Jazz Singer’s gimmick and it would be remembered as just another movie from the 1920’s. This film, however, is widely acknowledged as the first talking picture. It stars Al Jolson. It’s a universal story of dogged pursuit of career and Daddy Issues. Those are legit reasons (particularly the sound thing) to keep it somewhat relevant, but it’s also pretty dumb. Had it been made a few years into the sound era, it certainly wouldn’t have been recognized by the American Film Institute on their 1998 Top 100 list. 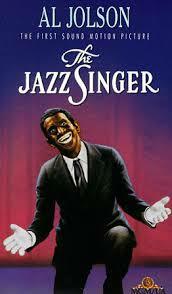 Even at that, the talking scenes are mostly just Jolson singing and doing his jazz act. When they give him and his mother (Eugenie Besserer) a scene that isn’t about music, he’s stiff and you can hardly hear what she’s saying. Sure, this was all new to people who’d been making movies for years without having to worry about dialogue. They were infants in the land of audio. You gotta cut them a little slack. Okay, slack cut. Back to beefing. This is one more in a long line of movies that rely on the “you perform tonight even though your father is on his death bed or you’re through” crutch. Nothing like a good guilt trip dealt out by show biz types who’ve OFTEN put their career goals over the needs of their family. As for whether not Jack Robin (Jolson) puts his father’s dreams of the son becoming a Jewish cantor over the son’s jazz career…that shall not be spoiled here. There IS much hand-wringing over it though, often literal hand-wringing. And then there’s the blackface! Arguments could be made that this movie was just paying homage to the racist staple of vaudeville days of yore and weren’t trying to make fun of black people. Still, we can’t just forgive them in their ignorance. It’s great that the movies finally got to speak in 1927 and The Jazz Singer was sound’s godfather. They might have looked a little harder for a more worthy story. And they could’ve found a way to avoid that blackface.